Experience stable, on-demand water pressure with Protege and Aurelaqua High Pressure & Diaphragm Pumps, exclusively available online at Edisons. 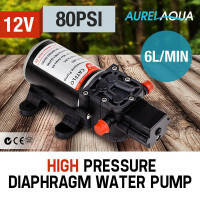 Ensure a dependable and uninterrupted supply of water with the best High Pressure and Diaphragm Pumps on offer. Built to last, Protege and Aurelaqua Water Pumps are the ultimate water solution for industry, farming, and household use. Protege Pumps are fast becoming the number one provider of Australian water pumping solutions. These pumps supply strong constant pressure equivalent to main line connections, never leave yourself dry with Protege. Reliably pump water up to 20 stories high, and keep your systems secure while also ensuring fine tuned pressure with accurate adjustment of activation pressure. Automatic flow control options also contribute to more user friendly end-products. Protege pump controllers boast auto-switching features thanks to class-leading electronic circuit boards for sensing water flow and pressure in the system. Demand the best with Protege. 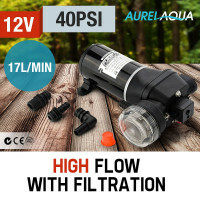 Available in variants of 4LPM, 5LPM, and 17LPM, enjoy on-demand pressure anywhere with Aurelaqua Diaphragm Pumps. Their unique design offers unparalleled capabilities, whether they’re for a camper, water purification or general cleaning. Aurelaqua Pumps effortlessly outperform other pumps in the range with permanent DC magnet drive, wide torsion, and stable pressure. Housed in strong but lightweight ABS casing, Aurelaqua Pumps are resistant to acid, alkaline and corrosion. Plus installation is a breeze. Round up all your water pumping needs with affordable and durable Pond Pumps, Oil Pumps, and Submersible Bore Pumps, all available online at Edisons. All Protege and Aurelaqua High Pressure & Diaphragm Pumps are backed by an Australian standard 12-month warranty for private household use, and a 3-month commercial warranty. Edisons guarantees fast and easy delivery anywhere, whether you’re in Sydney or the Outback. What are you waiting for? 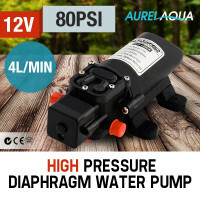 Buy a Protege or Aurelaqua High Pressure Pump or Diaphragm Pump today.